We first learned about Sandy Edwards and his Texas Pals in a letter to the editor in the December 1946 National Hillbilly News. We have later heard from a family member of one of the members of Sandy's group at one time. 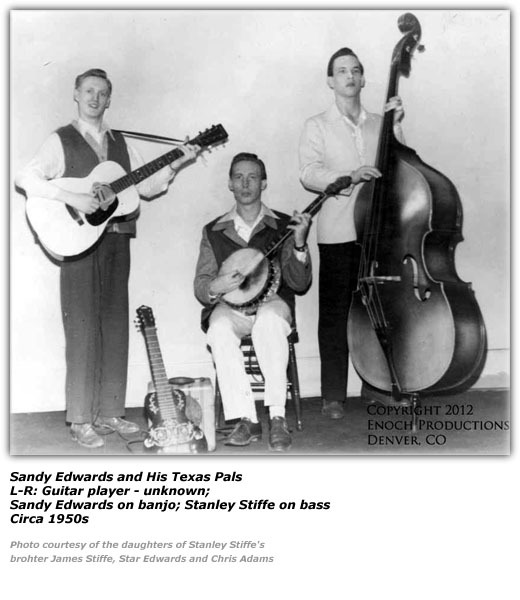 A letter to the editor in 1946 noted that Sandy Edwards was playing tenor banjo and doing vocals with the Chuckwagon Gang lead by Joe Barker at the time. A 1946 cast picture of the cast of the WWVA Jamboree does include Sandy. Mickie Steph LaRue wrote in her "Over the Airwaves" column for National Hillbilly News in 1950 about Sandy Edwards and his Texas Pals, giving us some details about this group that was popular in the Pittsburgh and Wheeling areas. Mickie told readers a bit about each member of the band. Sandy was the leader, did the emcee chores at personal appearances and on the radio, did solos and sang in the trio numbers. Pappy played the fiddle and Mickie said he was a "good right down" fiddle player. A fellow by the name of Gene played the steel guitar and did vocal solos as well. Mary and Ruth were a sister act that did "...mighty pretty duets". Ruth also played the accordion. Mary played the bass fiddle. In 1950, the group had a show on radio station WPGH, a 1,000 watt station at the time broadcasting over the 1080am frequency. On November 26, 1955, Sandy Edwards and his Texas Pals were part of a new show that "...pulled a whopping crowd, surprising many of the skeptics..." at the Carnegie Hall in Pittsburgh, Pennsylvania. It was staged by Marty Krauss and Howard Vokes, ever the promoter, was able to get this mentioned in The Billboard magazine. It was labeled the "Country Carnival Jamboree" and was to become a weekly event in 1956. Others on that initial show were Hank King, The Karroll Sisters, Matt Raye and His Alleghany Ramblers, Mac Martin and His Sunny Mountain Boys, Johnny Roberts and His Troubadours, Betty Brent and Her Rangerettes. Marty Krauss who was a disc jockey for WILY handled the emcee chores. According to the article, it was the first show of its type in Pittsburgh. Hillbilly-Music.com wishes to express its appreciation to Julio Edwards, the husband of Star Edwards, the daughter of the bass player, Stanley Stiffe, for sending us the photo and providing us with other details about the group for use on this site.